On 1 October 1659 students of the Leiden University started to pelt city guards with stones. One of the perpetrators was convicted by the University Court presided by the rector - students were exempt from the jurisdiction of the city of Leiden. Accompanied by some comrades and with great uproar the convicted student went to the rector, the famous theologian professor Johannes Coccejus, to get a redress. There was more to come. Two days later students disturbed with ‘great impudence and clamour’ one of Coccejus’ lectures. Moreover the illegal regional students associations, the so called nationes, made mutual arrangements to strengthen their position. Some students ignored the ancient ban on carrying weapons and took pocket pistols with them in order to defend themselves against the city bailiff and his men. Actually they planned to offend the rector for a second time. In another recent students riot the bailiff was even hit in his leg by a small shot. In the seventeenth century there were many harsh confrontations among students themselves and with Leiden citizens. How to discipline students was a regular theme in the meetings of the board of governors and the university Senate. 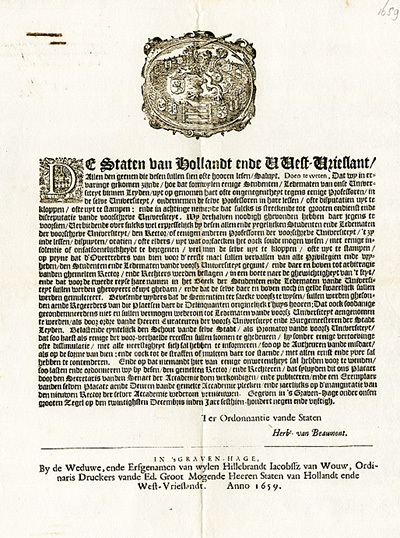 When things threatened to run out of control, the University addressed for assistance to the Sovereign Estates of the province of Holland, the founders of the University. This happened also in this case and as usual the Estates proclaimed a ‘plakkaat’, an edict. Dated 20 December 1659 this edict punished students who ‘from hatred or disinclination towards professors’ wanted to disturb lectures or disputations ‘by clapping their hands or stamping their feet’ with the loss of their privileges as university students and with a fine. Besides, the local authorities of the domicile of the convicted student would be informed. When someone repeated this offense, he was expelled from the university. The edict was read in public ‘ad valvas’, at the entrance porch of the University Building, and posted. Furthermore a second edict was proclaimed, a renewal of an earlier edict from 1629 against the carrying of weapons. Finally the ban on the nationes was mentioned in a new article in oath that every Leiden student had to swear. Leiden had many students from abroad. They couldn’t’ excuse themselves by claiming their ignorance of the Dutch language: a translation in Latin was also posted. Background of the unrest were the sharp controversies in the Leiden university between supporters and opponents of the ideas of René Descartes, but also those of … Coccejus. During that period attacks against his disputed orthodoxy and his compliance with cartesianism started to take place. Even scholars didn’t always treat each other with kid gloves. Post by Arend Pietersma, former curator of Leiden University Libraries.